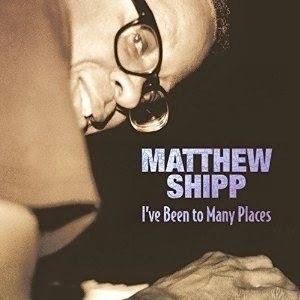 To me, Matthew Shipp is an uncompromising, passionate, correct and brilliant musician. Hot on the heels of his recent 2013 Piano Sutras and his two collaborations with Brazilian sax man Ivo Perelman comes his new release out this past Sept. 9th, I’ve Been to Many Places, a solo piano effort. Why the title? Well, to sum it up briefly it’s an encapsulation of influences and styles that have brought Mr. Shipp thus far and it’s truly superb. Despite his reputation being firmly planted in the avant-garde, he can also throw you a curve with some beautifully complex and well-chosen covers. Think you never want to hear “Summertime” or “Where Is the Love?” again? Me too until I heard Matthew’s versions. They invigorate and bring new life to these songs which is no small feat considering how many covers are out there. Just astounding. There’s a lot of music here. 17 songs and almost an hour of music and while I usually get bored with modern solo piano albums half way through I’ve listened to Matthew Shipp’s new one at least four times and haven’t tired of it yet. It’s that exciting and fresh. New layers have exposed themselves to me on each new pass. Other well-known covers among the 17 include “Tenderly” and Coltrane’s “Naima” but don’t stop there. The sequencing is fantastic and his originals are incredible as well. Shipp was born in 1960 and at 54 has the wiles of a man that age yet plays much younger with controlled aggression and abandon some of us can only dream of. For the uninitiated, he hit the NYC scene in 1984 playing with David S. Ware and Roscoe Mitchell among others but how many artists can you say tread new ground with each release and do it with total command and brilliance? Not many my friends. I Have Been to Many Places is one for the history books. An album of purity, grace, fire and genius that we will long remember. Highly recommended. Matthew Shipp is a funny dude. Hilarious discussion with Jeremiah Cymerman on the 5049 podcast.